Stream in the Hip Desert 新荒漠甘泉; Hip Food | God, stream in the desert, Recipes, Restaurants, Wine and Cheese, Family, relationship, Food, malaysian food, taiwanese food, nyonya food. 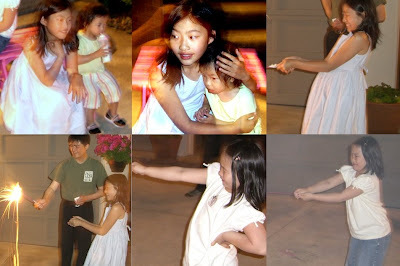 Little kids and “big kid” had fun playing with firecrackers. Little Chicken wanted to stay and watch but she was frightened as you can see from her facial expression. I have turned off comments for this article…. “There’s just too much against you this time you can’t succeed”. There’s no sense running anymore, three strikes, I’m out, why try? 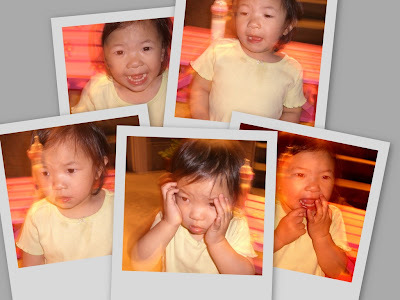 It does seemed like I have been out of the blogging world, doesn’t it? I have spent these few months developing my spiritual food page, my daily journal. I have received a few encouraging emails and comments from other brother and sisters in Christ on this page. So, I will continue to write. As for my main blog, when I have new discovery or ideas, I will continue to share. This week, I am sharing a short cut meal idea. Cook chicken drumstick in store bought Masala sauce. Onion and Tomatoes can be added to the sauce as well. Serve it with spicy Lime Leaf and Lemongrass Cashew Nut and store bought Naan or some Basmati rice. Top with some fresh herb like Cilantro as garnish. I would like to credit this short cut meal idea to Trader Joes. When I tasted their food sample this afternoon, I knew exactly what to make for dinner. And for dessert, Bubur Cha Cha (Yellow Sweet Potato, Purple Sweet Potato and Taro cooked in coconut milk). A complete short cut meal with dessert! The main course took only a fraction of the time to prepare compared to the dessert. Recipe for Bubur Cha Cha dessert adapted from Corner Cafe. This afternoon I heard that our Christian lives is like running a race. We fall, get up, fall, and get up, all the way to Heaven. The above poem is very encouraging because our Heavenly Father loves us and He doesn’t care if we win the race as long as we get up and try again. 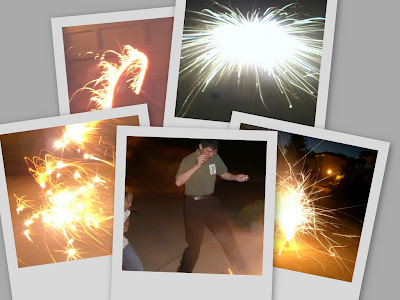 The photo above was taken at our recent gathering to bid farewell to a family moving to a different city. We had foods from different parts of China. I had a strong urge to post this photo this morning and I figured out why later, after I saw who was in the photo! The little boy is God’s secret. The father of this little boy will be speaking at this Sunday’s Gospel meeting. My girlfriend from Texas forwarded me some interesting photos this morning. 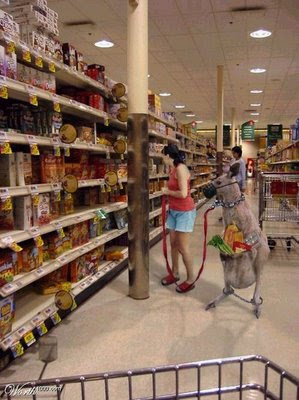 A couple of the photos include square watermelons in Japan, and a lady shopping with a Kangaroo in the grocery in Australia! Just read an older article from CNN on square watermelons and it is very interesting. Round watermelons take up space in the refrigerator, so the Japanese came up with square watermelons. Brilliant! I do not know the validity of the Kangaroo picture but growing square watermelon is possible. close up view of the soft and fluffy bread…. 3 years after I first wrote this article, I finally discovered a secret to making soft bread that lasts for more than a day. The secret lies in TangZhong, 65 degrees C, also known as the water roux method in some blogs. The night before you bake bread, prepare a paste call TangZhong. The process of cooking the flour helps retain the moisture. TangZhong is 1 part of flour to 5 parts of water. It is also known as the 65 degrees C because it is at this temperature that TangZhong is ready. Transfer TangZhong paste to a clean bowl. When it is slightly cooled, cover with a plastic wrap to prevent from drying up. Chill the TangZhong paste in the refrigerator overnight. This paste can be stored up to a few days. (If it turns grey, it is bad, throw it away!) Making TangZhong takes only a few minutes and the results is soft and fluffy homemade bread that stays soft longer. Mix 1/3 cup bread flour with 1 cup water until there are NO more lumps. Put the mixture in a pot and cook over medium heat. I stir continuously with my wooden chopstick. The mixture will thicken. Once you see “lines” in your mixture, turn off the heat. (1) Put all the bread dough ingredients into the bread machine. Choose the dough setting and press start. (2) After this cycle (about one hour and 30 minutes) the machine will beep. Remove the dough from the bread machine and place onto a silpat. 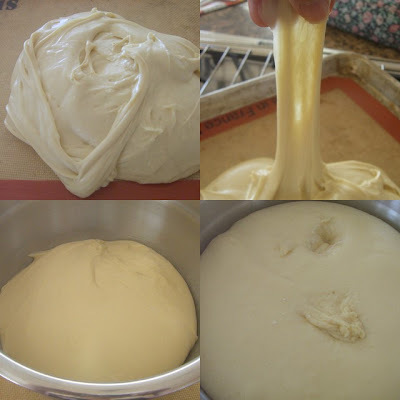 Divide the dough into 10 equal portions. Shape into bun-like shapes. Cover with cling wrap, let rest for 15 minutes. 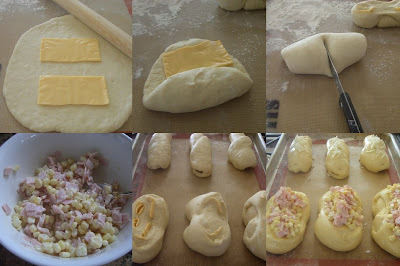 (3) Flatten each bun, add cheese slice, roll, cut and fold (as shown on pictures above). Do not top the ham and corn yet at this time. Arrange the buns on silpat and cover with a cling wrap. Leave it for the 2nd round of proofing, about 30 minutes. (4) After 30 minutes, the bread is ready for its topping. Brush whisked egg white on surface. Spread corn, ham and mayonnaise mixture onto each bun. (5) Bake in a pre-heated 375F oven for 13 to 15 minutes (reduce to 350F the last 5 min). Remove from the oven.